The apparent development of a large void of some billion light-years in diameter in the Constellation Eridanus appears to be improbable given current cosmological models. A radical and controversial theory proposes that it is a “universe-in-mass black hole” rather than hypothetical dark matter responsible for the phenomenon described as the expanding-accelerating universe. This radical theory of cosmology suggests that stars at the edge of the Hubble length universe are being consumed by a universe-in-mass black hole. In August of 2007, astronomers at the University of Minnesota located a gigantic hole in the universe. This empty space, stretching nearly a billion light-years across, is devoid of any matter such as galaxies, stars, and gas, and neither does it contain the strange and mysterious dark matter, which can be detected but not seen. Empty places in the universe are not uncommon. It is already known that matter tends to clump and form stars and galaxies, clusters and superclusters, due to the pulling force of gravity. So astronomers have already seen places in the universe where there are groups of matter and places where matter is more scarce. But this new discovery is much larger than any previously known “hole”. 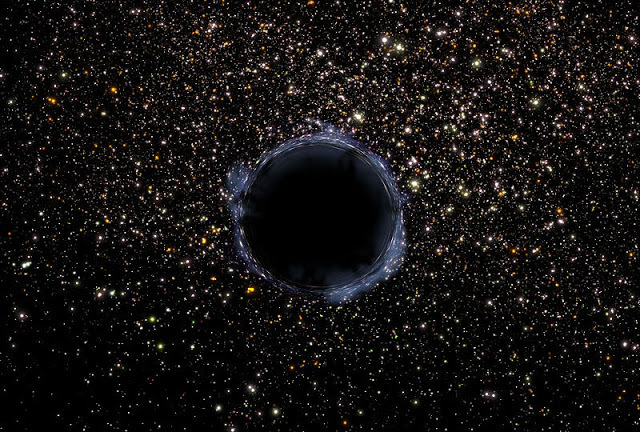 “Not only has no one ever found a void this big, but we never even expected to find one this size,” explains Lawrence Rudnick of the University of Minnesota. Rudnick was one of the researchers to find the hole. The area of sky in which the hole exists lies in the direction of the constellation Eridanus. Eridanus is the constellation of the River, and can be found winding below Taurus and Cetus. But the hole is not a part of the cosmic microwave background (CMB) radiation, which is a remnant of the Big Bang. The hole lies between six to 10 billion light-years away. The cold spot is a result of the CMB radition passing through this blank area on its way to Earth. Supporters of the standard model Big Bang theory say the region is colder because of dark energy. Dark energy, which has yet to be verified, can be seen as the opposite of gravity. While gravity pulls matter together, dark energy is what is causing the universe to expand, and at an ever-increasing rate. When the radiation from the Big Bang passed through this void in the universe, it had less energy than the radiation that passed through normal regions of space. In a simplistic explanation, the radiation is given a boost when it nears the pull of matter such as galaxies, and dark energy allows the radiation to propel away from these areas without losing the boost when gravity would pull it back. The radiation passing through the empty space does not get the boost and the energy, therefore it is slightly colder. A contrary theory proposed in The Journal of Cosmology suggests that our observable universe orbits a super-supermassive hole just as the stars of entire galaxies orbit and eventually are swallowed by the supermassive black holes at their center. Like the stars closest to the black hole at the center of the Milky Way galaxy which have a greater velocity than stars on the outer arms (where the Earth is located), stars at the edge of our known, Hubble-length universe, orbit one of these “universe-in-mass holes” at a greater velocity than those stars further away thus effecting the red shift and dimness of light and creating the illusion the universe is accelerating and exanding. The illusion of an “accelerating universe” is due to the gravitational effects of a universe-in-mass black hole at the edge of our Hubble length universe. Stars closest to the hole accelerate to their doom. Galaxies, stars, planets, moons, molecules, atoms, and so on, are continually recreated and destroyed, and matter and energy, including hydrogen atoms, are continually recycled and reassembled via activities associated with “black holes” also known as graviton-holes, gravity holes, super massive black holes, galaxy-in-mass gravity holes, and universe-in-mass gravity holes, depending on their size and gravity-mass. In an infinite universe, these galaxy-in-mass black holes become more massive yet and eventually consume all the galaxies which have been caught up by its increasing gravitational grip . Once all surrounding galaxies have been consumed, all that is left is a void, a galaxy-in-mass gravity-hole in the fabric of space-time surrounded by eternal night and empty space. The billion-light-years across “Eridanus black hole” is typical of black holes which have the gravity-mass of millions of entire galaxies. The Eridanus black hole sits like a giant black spider in an ocean of nothingness, having swallowed up all surrounding galaxies, gas, and light, including radiation from the Cosmic Microwave Background. Based on an analysis of the NRAO VLA Sky Survey data, Rudnick and his team in fact discovered that there was a significant and rather remarkable absence of galaxies even in the distant space surrounding this hole, in the constellation of Eridanus. Thus, the billion-light-years across “Eridnus black hole” must have consumed the gravity-mass of millions of entire galaxies all of which have been collapsed and concentrated into the singularity of this super-galactic hole. The billion-light-years across “Eridanus black hole” should not be considered unique or as something abnormally large. There appears to be a gravity-hole which may contain the collective mass of all the galaxies which populate a Hubble length universe and which sits just outside our known Hubble length universe; that is, just beyond that region of space which can be observed. Elsewhere, Is the he VIRGOHI21 black hole an example of what happens when the gravitional mass of an entire galaxy comes to be bound up in the singularity of a single black hole which becomes a galactic orphan devoid of any stars but which would then begin to draw distant galaxies toward it? Stars and entire galaxies are recycled. Stars grow old and die, becoming white dwarfs, brown dwarfs and black holes (Hawking 1990), all of which eventually, in an infinite universe, are swallowed by the supermassive black hole at the galactic center which becomes even more massive in size until all stars, young and old, within its galaxy, disappear inside. VIRGOHI21 has swallowed all the stars of its galaxy and has the gravity of an entire galaxy, an estimated total mass of about 1/10th the Milky Way, ten times more dark matter than ordinary matter, and is surrounded by vast clouds of hydrogen. Because of its galaxy-in-mass gravity, VIRGOHI21 has pulled up to 2000 galaxies toward it, creating the Virgo Cluster. More recently, in March 2009, astronomers using the the 1.2-metre UK Schmidt Telescope in Australia published a paper which revealed the discovery of an even larger, 3.5- billion-year-wide void while undertaking the Six Degree Field Galaxy Survey in the southern hemisphere. Enormous cosmic voids and giant concentrations of matter have been observed in a new galaxy survey, one of the biggest completed so far. One of the voids is so large that it is difficult to explain where it came from. Was the “Wow! Signal” Alien?